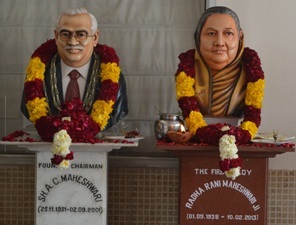 The school paid a fond tribute to Smt. Radha Rani Maheshwari, Ex-Chairperson of the school on her death anniversary,10th February,2017 .Mr. Bhagat Singh, the Principal, Mrs. Rama Biyani, management member, senior school officials and teachers offered floral tributes to her idol. The school choir sang devotional songs to pay their homage to her on the occasion.